In the past decade, the world has witnessed an unprecedented number of natural disasters of great magnitude. Hurricane Katrina in 2005, the Haiti Earthquake in 2010 as well as the 2011 Tsunami and nuclear crisis in Fukoshima are only some of the dramatic events that have shaken the world. These, however, appear to be only the tip of the iceberg. In recent years, studies have shown that both the frequency and the intensity of extreme weather conditions are increasing. According to the world methodological organization, the last decade has been the warmest in the past millennium. Extreme summer temperature is now observed in about 10% of the world’s land area, from less than 0.2% between 1951 and 1980. In addition, the world population is growing fast. An estimated 2 billion new people will join the world’s population by 2050, including over 1 billion in cities alone. Climate change and rapid population growth coupled will exacerbate the impacts on water and energy scarcity in some places as well as on rising food and energy prices globally. These issues already have severe implications for communities around the world, including population displacement, financial losses and economic decline. In 2011, 14 extreme weather events have caused losses of over $14 billion in the United States alone. As a result, considerable attention is now being paid to urban resilience, that is, the ability of cities to mitigate and recover from potential shocks and crises physically, economically and socially. I have recently attended the Resilient Communities in North America Workshop held in New Orleans and organized by the Joint Public Advisory Committee (JPAC) of the Commission for Environmental Cooperation (CEC). The goal of the workshop was to develop concrete and effective solutions to increase the resiliency of communities across the continent. New Orleans was arguably the most relevant city to host the workshop. The city has become one of the world’s laboratories for disaster recovery and a leader for urban resiliency. The city was hit by Hurricane Katrina in 2005, after which 80% of its territory has been flooded, and by a massive oil spill in the Gulf of Mexico in 2010. The city is slowly but remarkably recovering from the disasters. Conferences attendees and tourists are now back in the streets of the French Quarter and the local economy is showing encouraging signs of renewal, including increasing wages and the development of high-tech industries. However, New Orleans’ long lasting recovery has not been easy and still faces challenges. Despite billions of dollars in federal funds invested in the city’s reconstruction and in new levees, the population of the City of New Orleans has not yet fully returned to its pre-Katrina level. Only about 70% of the 485 000 residents of the pre-Katrina New Orleans had returned in 2010. Furthermore, the city’s high crime rate, disparities between races, homelessness and poverty problems have worsened since Katrina. What’s more, most of the City of New Orleans lies below sea level and remains vulnerable to future shocks and stresses caused by climate change. So, what can a city like New Orleans do to become a more resilient place? Of course, the answers will very much depend on the specific context of the city. In New Orleans, some innovative solutions are being implemented both citywide and at the neighborhood level to address issues such as storm water management, the reconstruction and resettlement of the poorest neighborhoods as well as the provision of affordable housing. 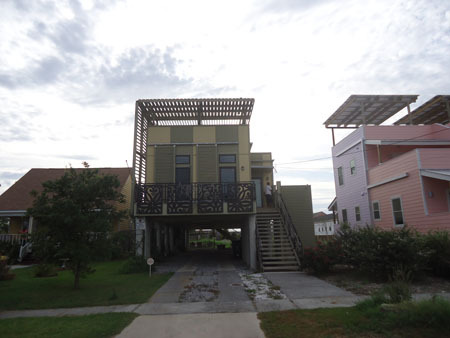 But one of the most striking examples is found in the Lower Ninth Ward, one of the worse affected areas by Hurricane Katrina, with over 4000 homes destroyed. 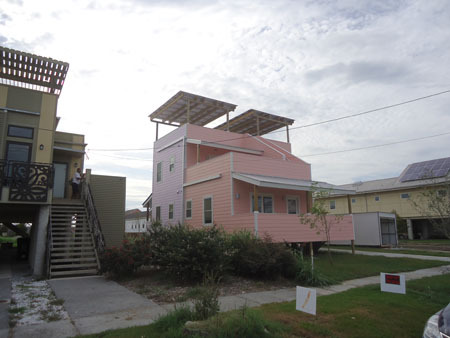 Brad Pitt’s Make it Right foundation funded and leaded the reconstruction of over 150 homes with cutting-edge design for the former local residents evacuated after Hurricane Katrina. The ultimate goal was the return of displaced residents in their neighborhood and the construction of a resilient community. All homes were built using the most advanced environmental design and socially-responsible standards. 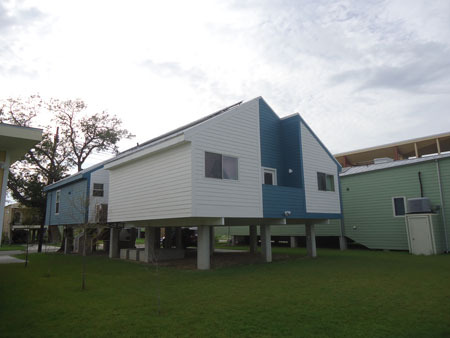 In addition to being affordable, the homes integrate several storm resilient features (elevated foundations, floating structure, integrated hurricane-proof window protectors, etc.) as well as energy efficiency and water management features (solar panel on rooftops, rainwater harvesting system, etc.). Local contractors are favored in the procurement process and efforts are made to use locally-sourced and recycled materials. Also, some actions are currently underway to build community facilities in the area as well as to achieve community building goals. 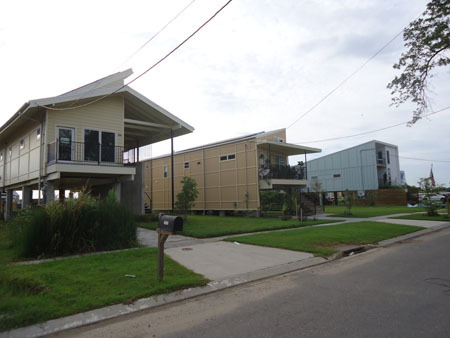 The Lower Ninth Ward project in New Orleans is an illustrative example of how resilience can be delivered through innovative and locally-sourced solutions. Also, lessons learned from New Orleans remind us that the path to resilience is an ongoing process, and can only be achieved through strong collaboration between local authorities, business community and civil society.